Now here is a delightful story that combines the love of the sea and coastal life in Nova Scotia , with an intriguing yarn about a young boy into whose life an old salt enters on a stormy day in winter. It has the makings of a classic, especially for youthful readers. There do not seem to be many youth oriented novels about the sea, and this one is quite special, offering memorable characters, adventure, intrigue, and self discovery. A stormy day at sea forces a sailor headed for Boston from England to sail into a small port in Nova Scotia . 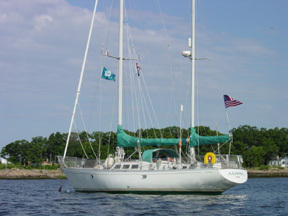 He brings his gaff rigged yawl expertly into the dock at the local seaside inn run by a lovely woman and her son. The inn has seen better days, and it seems that fewer guests arrive each year, until the timely arrival of Captain Charles Johnson , of course. Who is this mysterious stranger who crossed an ocean and seems to know more about the ancient pirates than any mortal should? Isn’t it lucky that he arrived just as 12-year-old Jim had declared pirates as his subject for a paper? What a wonderful antidote to writer’s block. And of course, Captain Charles becomes more and more entrenched in the operations of the inn, which grows ever more successful the longer he stays. Besides, he knows all about the loves of our personal hero, Grace O’Malley , the pirate Queen of Ireland! So it’s really a book about pirates delightfully woven into a novel about a young boy’s life in Nova Scotia . It is also beautifully illustrated by this master maritime artist whose works have been exhibited in major settings and who is widely considered to have touched off a modern movement in the art of scrimshaw. What a find for a cold winter’s night! Although appropriate for young readers, it can be enjoyed by all ages. 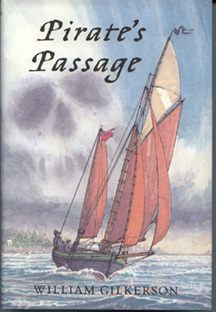 William Gilkerson ’s Pirate’s Passage, his second illustrated novel, was released by Shambhala Publications under the Trumpeter imprint, and distributed by Random House, as of December 2005.